Bewley’s Irish Breakfast Tea is an invigorating blend of Assam and Darjeeling Teas which will ease you into your day as only an Irish cup of tea can. 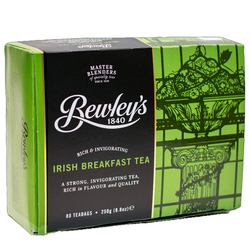 Bewley's Irish Brakfast is an award winning tea with a bright golden colour. 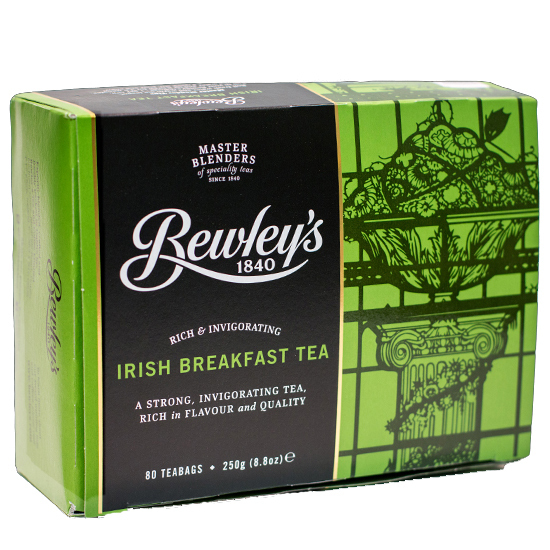 The best way to make Bewley’s Irish Breakfast Tea is to warm the teapot. Then add the required amount of tea bags. Pour on freshly boiled water, stir the tea bags and allow to settle for up to five minutes. Always stir before pouring. A great way to start the day! Bewley’s teas have been an Irish tradition for more than 160 years. For generations the Bewley family have been blending the finest teas, providing people, both at home and abroad, with a real taste of Ireland .